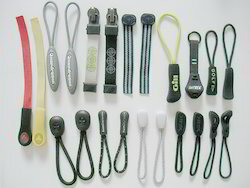 Offering you a complete choice of products which include plastic zipper pulls. With a precise understanding of the relevant industry, we introduce ourselves as the leading manufacturer, trader and supplier of Plastic Zipper Pulls. Used in hand bags, luggage bags, travel bags, these zipper pulls are designed using premium quality plastic and ultra-modern technology. Plastic zippers mostly use polyacetal resin, though other thermoplastic polymers are used as well, such as polyethylene. We are providing these zipper pulls in different colors, designs and textures. Looking for Plastic Zipper Pulls ?